NE winds in Karachi since 5 days! Heavy rainfalls have battered the province of Sindh once again that has made many people homeless while large number of land has also been flooded as feared. Flooding has also occurred in FATA and Khyber province. Monsoon was highly active all over the monsoon belt of the country since last few days especially Sindh which saw around 100 mm rainfall during the last few days. Temperatures remained in comfort-zone, while humidity remained high across the country, some stray thunderstorms passed into the non-monsoonal regions of Pakistan. *Low pressure in the north-eastern sector of Arabian sea has intensified, pressure dropped from 998 mbar to 996 mbar. *Another low pressure over Madya Pradesh that formed as an upper air cyclonic circulations in the Bay of Bengal few days back. *Temperatures are expected to remain in comfort zone and not expected to change while humidity will remain high due to frequent showers in some areas. Heavy monsoon downpour have created another wave of destruction for the people of Sindh as many area of land has been flooded while a number of houses have collapsed. On September 2, at least 3 people have died in Sindh due to same reason. The death toll since June 25 has now raised to 211. Monsoon is expected to remain active in the monsoon belt of Pakistan during the next few days. During the coming period monsoon moisture is likely to continue to penetrate in almost all monsoon belt of the country with few gaps. *5th monsoon spell in Sindh is likely to re-intensify. *After the short 7th monsoon spell in upper Pakistan, another 8th spell may start. *The low pressure over Madya Pradesh is likely to send fresh monsoon moisture to south-eastern Sindh on September 3 night/September 4 morning, also the present low in the Arabian sea will also leave some moisture over Sindh but after September 2 night. *Monsoon winds from Sindh will move again towards Balochistan and south Punjab. Rainfall will start in the capital around September 4, it will be light to moderate intensity and continue till few days with few gaps . 32 °C to 35 °C in Islamabad. In Northern Punjab: Lahore, Faisalabad, Murree, Rawalpindi, Sargodha, Sialkot and other adjoining cities. Rainfall with scattered moderate falls expected from September 4. Rain will be accompanied by thunder and fast winds. 32 °C to 35 °C in Lahore. 33°C to 48 °C in Faisalabad. 28°C to 33°C in Murree. In Southern Punjab: Bahawalpur, Multan, Rahim Yar Khan, D. G. Khan and other adjoining cities. Rainfall will be moderate and chances of isolated heavy falls expected after 2 days. Rain will be accompanied by thunder and fast winds. 34 °C to 36 °C in Multan. 34 °C to 38 °C in Bahawalpur. In Upper Sindh: Sukkur, Larkana, Jacobabad, Kashmore, Nawabshah and other adjoining cities. The fresh monsoon winds will enter from September 3 or September 4 morning and continue till 2 to 3 days. Rain will be accompanied by winds and thunder, it will be moderate in intensity with chances of isolated heavy falls.. Temperatures forecast for Upper Sindh. 32 °C to 37 °C in Sukkur. 34 °C to 38 °C also in Larkana. 35 °C to 38 °C in Nawabshah. In South-eastern Sindh: Mirpur khas, Umerkot, Tharparkar, Badin and Hyderabad. The monsoon winds are likely to intensify from September 3 or September 4 morning till 2 to 3 days. Rain will be accompanied by fast winds and thunder, it will be mostly heavy in intensity with chances of isolated very heavy falls in some eastern parts. There are fresh chances of flooding in Mirpur Khas and Badin districts. Temperatures will also calm in south-eastern Sindh due to long spell of very heavy rainfall during last few days. 32 °C to 33 °C in Hyderabad. In coastal Sindh: Karachi, Thatta, Keti, Shah Bandar and other coastal localities. The current monsoon spell will re-intensify from September 3 night/September 4 and continue 2 days, Rain will be accompanied by fast winds and thunder, it will be moderate in intensity with chances of isolated heavy falls in Karachi while chances of scattered heavy rainfall in Keti Bandar and Thatta. 31 °C to 34°C in Karachi. This monsoon activity will continue till September 6 in Sindh then a decrease is expected in Sindh. 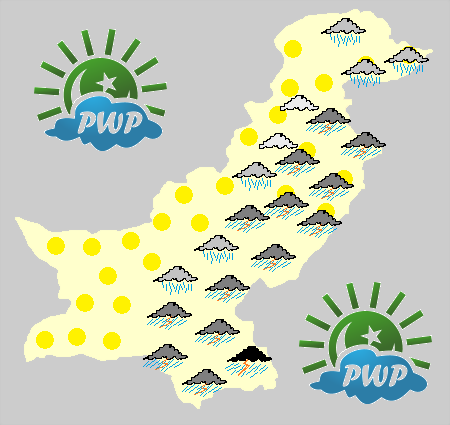 ← Pakistan Weather Portal (PWP) – August in review! Best rain of 2011 yet ! is it still raining, did it cross 50mm barrier in any part of the city? I am just guessing/predicting that it will rain again in couple of hours around 10pm. Since i am not in Karachi so i am wondering did the colud came from NE? I think rain has started again at the airport. Most sites sh0wing rain n0w. Conditions : Rain, Cloudy, Warm. Light rain with thick dr0plets started here. Kher now whats next?/ Is it going to continue or is it over?? Is this weather system dissipating ??? monsoon of pak page…it is showing signs of weakening now…. yeah it seems to be, various Gfs models suggests,it might dissipate in next 48 to 72 hours…. But they are not sh0wing that the Fresh Low will c0me t0wards Sindh. Updates ka irada nai ha ?? it’s raining lightly here since 7PM. north karachi got only 6mm of rain yesterday so i want heavy rain today in my area. Is it raining now anywhere in Karachi? KM could we except heavy downpour again 2dae??? would this low give us an other heavy downpour???????? I think this system is m0ving t0wards Karachi. more chances of rainfall expected in 24 hours…. wh0le SIndh and it is very cl0se to Karachi. So, are there chances of heavy rainfall in Karachi t0day ? Sometimes i feel like Karachi is not in Sindh ! I just don’t kn0w why isn’t it raining. This system has covered whole Sindh including Karachi. According to PMD, the system has completely covered Karachi. babar bhai aj ki heavy rain ne to Mirpurkhas City ko tbha kar diya.aagy kya expected hai weather Mirpurkhas City k liye??? chances of more rainfall till tomorrow mid-day/evening..then slight decrease..
any good rain expected ? will the up coming low pressure will good for karachi? @ K.M, Are there any chances of rains over KHI Today? PMD’s IR Image sh0wing that the system is completely over Karachi but it still isn’t raining, why ? 70MM rain occured in Karachi when this system was far away from Karachi. All sites are showing that the current condition in Karachi is sm0ke. Do they really mean sm0ke or it’s some other kind of sm0ke ? BBC sh0wing RAIN for Karachi again from SATURDAY. @EVERY BODY – updates at 9 or 10 pm, due to busy schedule…. Monsoon of page for latest update……. First, Mithi g0t 309mm rainfall from a strong low pressure from 10th – 13th august. No rain for Karachi till 11 september. yes, there are chances of Larkana from September 11 evening/night and then increase..
karachi wont get any good rainfall hate it !!!!!!!!!!!! We got 70mm rainfall from this system. Tomorrow: Thunderstorms likely. High near 90F. Winds WNW at 5 to 10 mph. Chance of rain 90%. Met Office informed that another monsoon weather system (low pressure area) has developed over eastern parts of India, which is heading towards southern parts of Pakistan. Under the influence of this weather system, more widespread rains of moderate to heavy intensity are expected in Sindh, South Punjab and Eastern Baluchistan from Sunday evening to Tuesday. Scattered rains are also expected in Upper & Central Punjab, Khyber Pakhtunkhwa and Kashmir during the period. will it rain karachi and when ?? PWP did said similar things in its monsoon of pak page on Sept 5…………as far is Karachi is concerned… chances of showers from tomorrow night/Sept 11..
What is this KM ! late updates and where is the new article ? FRESH SPELL = STRONG SPELL ? intensity much less than 2nd and 5th monsoon spell…..
No chance of heavy rain in Karachi right ? i will post the new article at 10:30 or 11 pm tonight…all of it will be in it..